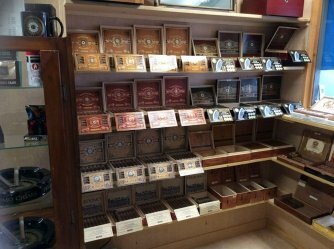 Rizzo’s Side Door and Tobacco Emporium located just west of 2nd Street on Orange Avenue in Fort Pierce and is often called a hidden gem. Rizzo’s offers a cozy space for you and your friends to gather while sharing a stogie, listening to the best in local music and entertainment, sipping a cold beverage, or grabbing a coffee to go. Rizzo’s has been offering up the good vibes since 2016, w the Rizzo family saw a need for a place to relax and unwind with a good smoke in a funky urban setting. Rizzo’s expanded their Side Door set up and offers seating for 40 at their outdoor bar and stage. With complete facilities, Rizzo’s is a great spot for your next private event. Go check them out any weekend night for the best in live local entertainment. Rizzo’s is a slice of old-world charm in the downtown Fort Pierce landscape.